Ideal test lead wire for building Do-It-Yourself (DIY) test leads, patch cords, and test fixtures. Silicone is the best test lead jacket material, combining high flexibility, even at low temperatures, with resistance to burns and chemicals. The conductor is highly stranded soft bare copper for additional flexibility. Meets the safety requirements of IEC 61010-031 CAT III. IEC rating: 1,000 V CAT III. Current max: 36 A. Jacket material: silicone. Conductor area: 2.50 sq mm. Wire gauge: 13 AWG. Stranding: #651 x 0.07mm diameter. Temperature: -60/+180 degree C. RoHS (2002/95/EC) compliant. Measures 3.9mm outside diameter by 100m length. Black color. If you have any questions about this product by Cal Test Electronics, contact us by completing and submitting the form below. If you are looking for a specif part number, please include it with your message. 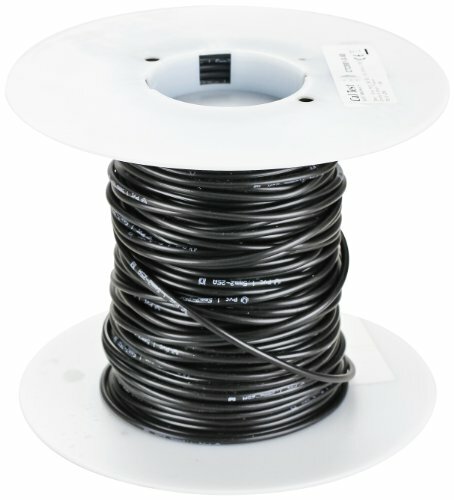 4 AWG Stranded THHN Black Wire - 500 Feet - 600 Volt 90C - Made in USA! 14 AWG 4/C Str CMP Plenum Rated Shielded Sound & Security Cable - 1000 Feet - EWCS Spec - Made in USA! Sandvik Precision Fine Tetrode Wire 1,000 Feet.